When you’ve faced what can seem like an endless stream of bad weather days, entertaining young children indoors starts to test even the most creative parents. Here are ideas for indoor adventures out and about, building on our recent article, 11 Fun Indoor Activities for Bad Weather Days for keeping kids entertained at home. Be sure to think ahead about packing snacks or lunch depending on whether you want to buy food where you are headed. There’s nothing like hearing “Mom, I’m hungry” two minutes into the adventure after the effort of getting out of the house! Consider the easiest way to handle parking or public transportation with the kids in tow, especially in the midst of snow or pouring rain. An obvious convenience in bad weather when you have young children are places with covered parking lots like the California Academy of Sciences and the Cleveland Botanical Garden listed below. While we have listed a number of free options below, many places such as community centers offer need-based scholarships. 1. Children’s museums and science centers are an obvious source of fun. Two outstanding San Francisco museums are the California Academy of Sciences and the Exploratorium. Joining your favorite museums can be cost effective so that you can visit for short periods of time whenever the mood strikes. That way we avoid the temptation to stay longer than best for children’s temperaments to feel we got our money’s worth out of an individual day ticket. 2. 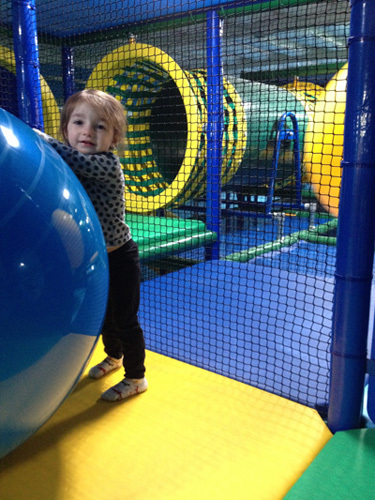 Indoor play venues with features like bouncy houses, climbing equipment, slides, and mini golf. For example, the new La Petite Playhouse in Redwood City, California, features giant undersea-themed structures, climbing wall, and a separate baby/toddler play area. 3. Your city or county recreation department or local community centers often have drop in play programs for young children in addition to swimming pools, play equipment, and inflatables or gym areas available for families to enjoy. For example, my Cleveland Mandel JCC offers drop in Family Place activity center and gym programs for young children. The San Francisco recreation and parks department offers drop in toddler gym in multiple locations. 4. Most public libraries offer a variety of programming for young children which is usually free. 5. Bowling with bumpers in place on the lane is a great activity to entertain different aged children for a few hours. 6. Try out an indoor roller or ice skating rink. 7. Visit a make your own pottery center or other craft activity program. 8. Attend a puppet show or children’s theater show, checking on which age ranges it’s meant for. Many orchestras and performance venues have special children’s programs and concerts geared to kids of specific ages. 9. Go to an indoor sports facility, checking ahead for what activities they offer for different aged children, ranging from soccer to batting cages. 10. Explore an indoor botanical garden. The beautiful Cleveland Botanical Garden includes an indoor Glasshouse featuring two different exhibit areas representing the spiny desert of Madagascar and butterfly-filled rainforest of Costa Rica. Many zoos have areas such as a rainforest building that is indoors. 11. Check out what your art museum or other museums in your community may offer for young children. While traditionally not a first choice for entertaining kids, many art museums are adding features to introduce children to art and make it more engaging. For example, the Cleveland Museum of Art launched “Gallery One,” an interactive, touch exhibit and iPad app to make art more fun and accessible to kids. When visiting art museums with kids we mainly focus on more adventurous exhibits like the knights in shining armor and skip the aspects we know will be snoozers to the youngest in the group. 12. Get together with a favorite friend(s) who have children similar in age to yours. Join together to do one of the above activities together.